A colleague recently started me off on this whole thing. We have been working on improving our indexing algorithms, and his (rhetorical) question was how anybody could assert (as we were hoping to assert) that the changes being made were improving (or going to improve) the quality of search. His point was that if you cannot measure it, you cannot manage it. As usual (at least for him), he had part of the solution worked out already - his ideas form the basis of the user-based scoring for precision calculations described below. is twice as important as recall, etc. For my own understanding, I drew some gnuplot charts of E against P and R, which I also include below - they may be helpful to you as well. As you can see, the quality of search is inversely related to the value of E, ie, if E goes down, search quality goes up, and vice versa. The best value for E appears to be when P and R are about equal (depending on the value of β, of course). In this article, I describe how I calculate E for a given set of indexes built off the same corpus, each index corresponding to a block of iterative algorithmic changes in the index building code. Based on the above, I define R for an index as the normalized count of the average of the number of relevant results returned from all my benchmark queries against that given index. The formula for precision is r/n, where r is the number of relevant documents returned from a total of n documents returned from a search. This is easy enough to calculate, but does not capture position information, ie, the fact that a good result at the top of the results is more valuable than one at the bottom. The overall precision for the index is calculated as the average of the sum of weighted scores for each query result, across all queries against that index. The weight reflects the importance of the score based on its position. Nunscored = number of results which were unscored, ie new. The value of U is used to calculate upper and lower bounds for the E-measure by calculating E(P+U, R) and E(P-U, R). Because the back-end code is part of a Spring web application, it is injected with quite a few specialized data access beans and if I had to show them all, this post would get very long. So I just provide pseudo-code for this job here. Essentially, all it is doing is executing a fixed set of queries against a fixed set of indexes, and looping through the results, looking for matches against the baseline, and calculating recall and precision appropriately.. The chart(s) are generated dynamically off the data populated into the database by the backend process described above. I could have just used a table to display the results, but a graph makes things easier to visualize, and besides, I have been meaning to try out jfreechart for a while, and this seemed a good place to use it. The code to allow the user to score individual search results and calculate the effectiveness scores are all part of a Spring web application, so I needed a way to show the graph on a web page. The controller just reads information off the table and builds a chart, converts it to a PNG bytestream and writes it into the response. The application allows scoring for different kinds of search, so multiple charts can be generated and shown on the same page. Here is the code for the controller that generates the chart. The JFreeChart project has a pay-for-documentation business model, but there are any number of examples available on the web, which is where I got most of my information. I provide some comments in the code, but if you need more explanation, I would suggest looking at the many available JFreeChart examples. The Controller is called from an image tag from the JSP page like this. That way we can have multiple image tags and they are all started off in parallel while the page is loaded. 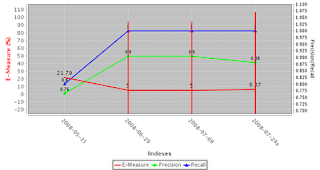 As we can see from the chart above, both recall and precision increased initially from the baseline index, and the E-Measure came down from 21.79 to 5, but then some algorithm change between 2008-07-09 and 2008-07-24x caused a slight decrease in the precision and a slight uptick in the E-Measure. I think automated search quality metrics such as these can be quite useful as an early warning system for unexpected side effects caused by some algorithm change, as well as a way to measure how a change or set of changes affect the overall search quality.